ForcePAD is an intuitive tool for visualising the behavior of structures subjected to loading and boundary conditions. The design of the user interface aims to be as intuitive as a standard image processing software. Users should be able to design structures, apply loads and define boundary conditions without knowledge of the underlying finite element model. 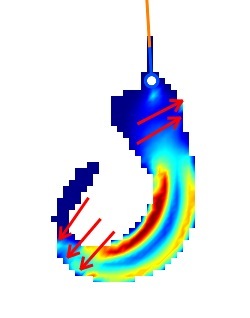 ForcePAD is also designed to give an intuitive image of stresses and deformations in the material. Some of the documentation (i.e., screenshots) are in Swedish and the instructions are fairly barebone. But one can quickly do studies of a variety of shapes and configurations such as this "fishhook" that I sketched up in about 2 minutes. Cool stuff.